Hosting is a big business in today’s world. All online activity is hosted on best servers. Do you have business in hosting ? If the answer is yes, then you need to present your business to your visitors in an attractive way. Hosting WordPress Themes are the best way for presentation. These themes are mobile responsive and have lot of customization options. 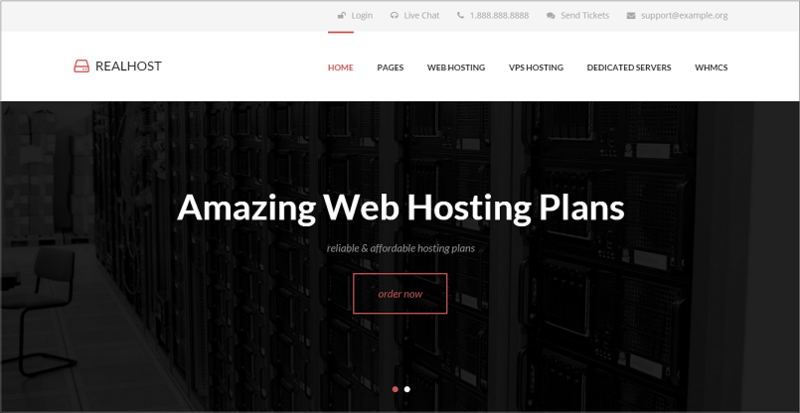 Hosting website have a pricing table, comparison pricing plus other awesome features. Amazing designs lead to more visitor lead. 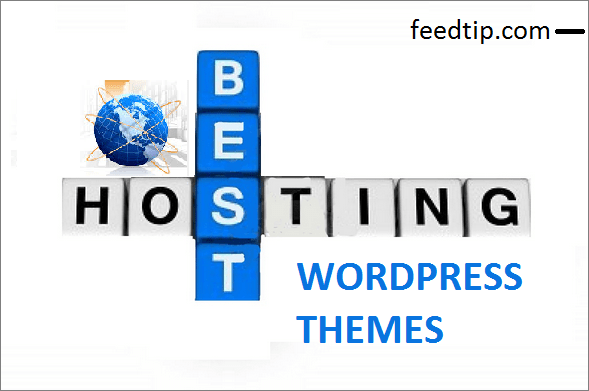 Below is the list of best hosting wordpress themes . Racks is a multipurpose responsive wordpress theme. The design is clean and modern. HTML5 and CSS3 has been used to make this theme. It is an ideal theme for web hosting ,server selling businesses, corporate and other company websites. Racks supports WHMCS Bridge plugin, hence it integrates WordPress with WHMCS. The theme is retina ready. Racks have six layout schemes to choose from – blog layout, shop layout, portfolio layout etc. It is translation and SEO friendly. This premium theme includes free plugins worth $64. You can customize colors, headers, layouts etc by using advanced option theme panel. One has option of choosing different layouts for each post and page. This awesome theme is worth $49 . It is available at themeforest.net. Check the demo below. InHost is a premium responsive wordpress theme. It is a clean , powerful, modern multipurpose theme. The theme can be used for hosting business, corporate ,design agency and other businesses. It is fully compatible with WHMCS. 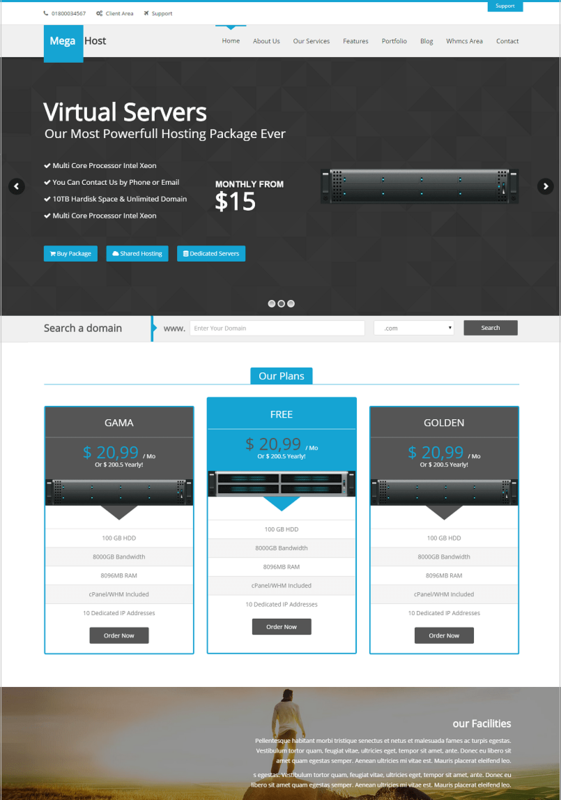 It includes 40 plus blocks like pricing, client testimonials etc needed in hosting business. InHost is retina ready and compatible with most browsers. It has 5 layouts for homepage, banners for ads with animation effects, plus lot of shortcodes. There are free plugins worth over $55 – Revolution slider, Visual Composer and Mega Main Menu. Plus 46 layered files in PSD format. The best part is you can customize the layouts in an efficient way. Multi Host is a WHMCS compatible hosting WordPress Theme. It integrates perfectly with WHMCS bridge plugin and WHMCS Domain Checker Plugin. The theme is responsive with retina display. HTML5 and CSS3 coding has been used . Multi Host is one of the powerful, stylish wordpress theme. It has 5 homepage styles , 2 layouts ( Boxed / Full Width), more than 5 header styles and 20+ skin color choices. The free addons worth $30 is included in the theme- Layer and revolution slider. Other benefits included are – Google Webfonts, All in One Seo Pack, MailChimp Plugin, Yoast WordPress SEO, Responsive Google Map etc. The theme is WPML ready. You can customize the theme by using it’s Advanced Buddha Panel . You get free lifetime updates. The best part is this theme comes with plenty of shortcodes , widgets, WHMCS widgets etc needed for web hosting. 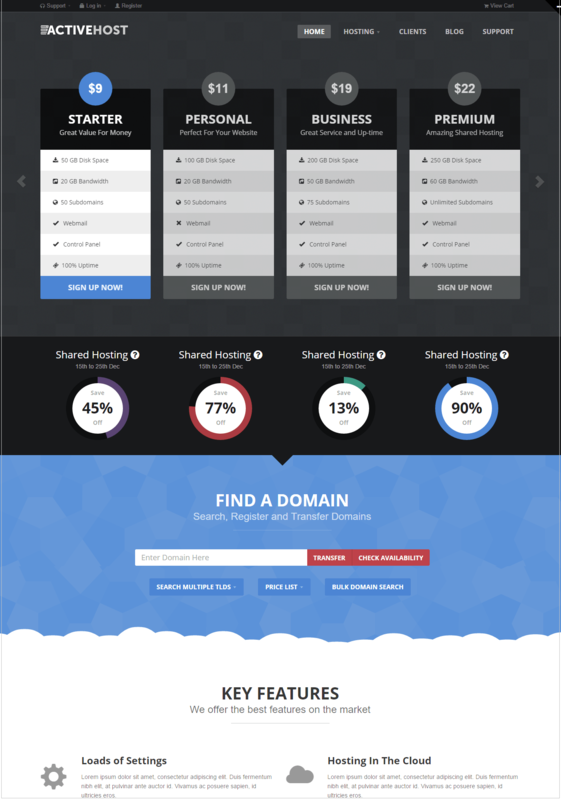 Active Host is a flexible responsive theme. It is ideal for hosting wordpress websites. The theme is fully compatible with WHMCS. Active Host is customizable via beaver builder drag & drop plugin. The plugin is provided free of charge. Active Host contains lot of widget which are customizable. Other features include two WHMCS cart table options, WHMCS domain look up, flexible footer/ slides, customize layouts for category/posts and lot’s more.. Seven Host is a multipurpose responsive WordPress Theme. This theme works well for businesses like hosting, technology, corporate site, design agency, blogging, freelancers or as portfolio website. The design is clean, modern and powerful. It has seven homepage layouts, fixed or floating menu styles, 6 plus theme header options. full screen slider, unlimited colors & sidebars. 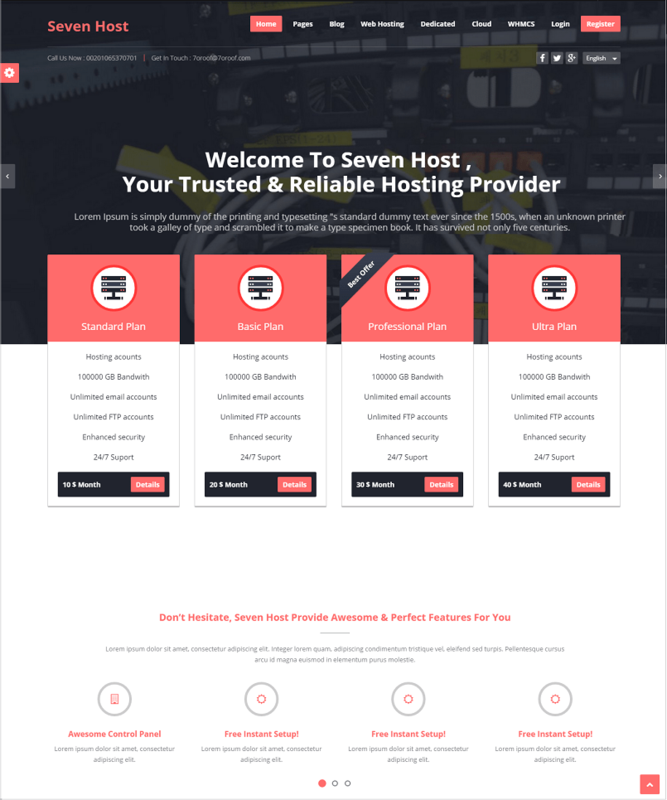 Seven host is build with latest HTML5 & CSS3 coding. It is retina ready The theme is build with bootstrap framework. Seven host is fully compatible with WPML, WHMCS via installing WHMCS bridge plugin. The web theme has a free add worth $28 – Visual Composer. You can have a boxed or wide layouts. There are 5 pricing table options, includes a domain search area, add testimonies in 6 different styles . Plus lot more addons to make a perfect powerful website. RealHost is a premium responsive WordPress theme. Ideal theme for hosting companies. It is compatible with WHMCS by installing WHMCS bridge plugin. The design of the template is clean , simple with a modern touch. It includes custom widgets, shortcodes and layouts. The contents awesome due to BxSlider Content and VPS Sliders. More that 360 fonts and icons included. And there is more in store.